The only book dedicated to covering the decision-making powers and procedures of the Parole Board. 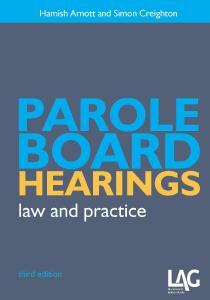 Parole Board Hearings: law and practice continues to be the only book dedicated to covering the decision-making powers and procedures of the Parole Board. It provides practical and detailed guidance on parole processes, including recall, for those serving both determinate and indeterminate sentences. In the four years since publication of the second edition, the pace of change continues. There have been significant developments in the parole review process. It is vital that practitioners have a textbook which brings up to date the current state of parole law and the powers and duties of the Parole Board. The appendices contain the Parole Board Rules, relevant statutory extracts, directions and guidance and a list of useful contacts. Parole Board Hearings: law and practice is essential reading for lawyers, advisers, prisoners and their families, and all those working within prisons and for the prison and probation services and related bodies. Simon Creighton is a partner at Bhatt Murphy solicitors in London.